New Promo – S’MILK BUCKS! 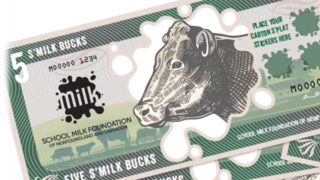 The School Milk Foundation of Newfoundland and Labrador is offering a brand new promotion this year called S’Milk Bucks. S’Milk Bucks is a collect to win promotion suitable for all ages, with multiple prize draws in December (2017) and June (2018). This promotion is designed to run continuously throughout the entire school year. All Completed and returned S’Milk Bucks will qualify for the grand prizes. There are no limits on the number of S’Milk Bucks your school can utilize. The more milk students drink, the greater chance they have to win individual prizes or grand prizes. * S’Milk Bucks can be sent individually or as a bundle from schools, parents, staff members, cafeteria personnel, etc.